I’m so excited to announce that today is the first day of my TSNC Big Advent Calendar Giveaway! Every day for the whole of advent I’ll be bringing you a brand new giveaway from some amazing companies. Some will be massive names you’ll all know already, and some giveaways will be perfect for discovering lesser known brands – and all are handpicked and loved by me. You’ll see beauty, skincare, fashion, jewellery and home accessories – and I can’t thank these companies enough for working with me on this! I’ll also be holding some flash giveaways on Twitter and Facebook, so keep your eye out for these too! Each giveaway will be published at 9am every day of advent, and they will be open for entries for four days only. There will also be an advent calendar link on my homepage where you can click on each day to take you the giveaways directly. So let’s kick off day 1 with a fantastic bundle of prizes from Hothair and Freedom Makeup! Hothair are giving away their amazing 8 Piece, 19 inch Human Hair Clip in Extensions worth a massive £185.00! These 100% clip-in human hair extensions are super easy to use, and add incredible length and volume in an instant, just clip in and go! You can also wash, colour, curl, straighten, and blow-dry them just like your own hair. Each pack includes a whole head of extensions (8 pieces) and each weft comes attached to comfortable and secure butterfly clips. The 8 pieces of weft contains – 3 pieces of 8 1/2″ wide wefts, 3 pieces of 5 1/2″ wide wefts & 2 pieces of 3″ wide wefts. These extensions are available in a range of 14 natural colours, and the winner may choose which shade they would like from the website. Freedom Makeup comes from the creators of one of my favourite budget beauty brands, Makeup Revolution. 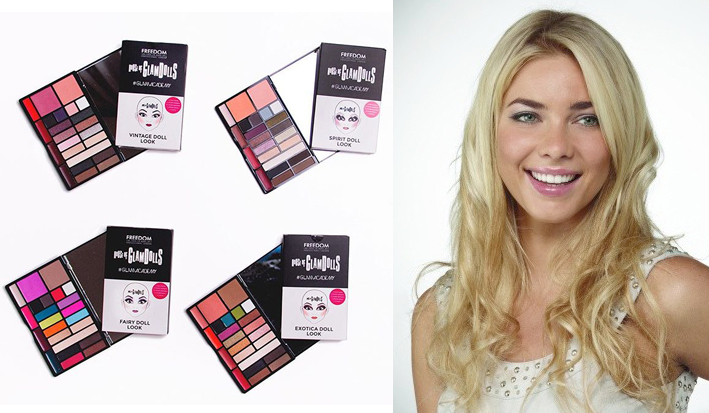 Freedom’s aim is to bring you professional quality makeup at affordable prices, and they’re kindly giving away not one but all FOUR of their House of GlamDolls Palettes! Each palette – Spirit, Vintage, Exotica and Fairy includes a selection of eyeshadows, cheek colours and lip shades to create a different look! The set of four is worth £32 in total. To win both of these prizes, worth a massive £217 just enter via Rafflecopter below! This giveaway will run for FOUR DAYS only so be quick! It’s also open internationally, and if you have any questions please feel free to ask. Good luck! Previous Post Oliver Bonas Home Accessories Haul! Very exciting gifts, I’ve always wanted to have hair extensions and who doesn’t love new makeup to try. Thank you! not seen these palletes before so enjoyed finding out more & entering – thank you!